The shape of the Egg of Life is the second stage after the structure known as “the Seed of Life” – 7 circles intersecting and known as the geometrical/mathematical basis of the entire creation. Each living creature evolves in balance through the structure of the Egg of Life. The structure also contains the entire world of music since the distances between the cells create the basic musical scale of half a tone and a tone. In fact, all possible musical scales, as well as reality’s frequencies, are hidden in the shape of the Egg of life. 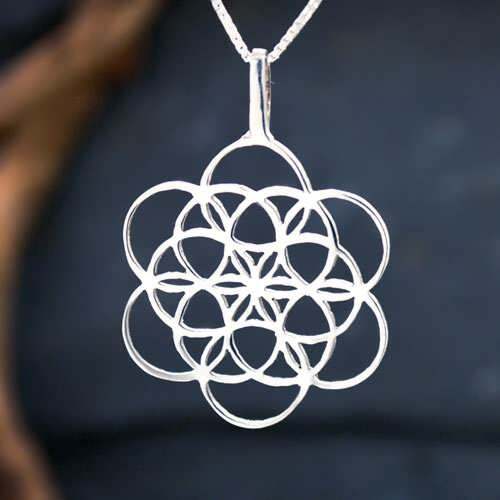 The decision to create this structure as a pendant comes from an amazing story of one of the visitors to the website. A person named R. Potter represented himself as a musician and wrote that a few years ago he felt an urge to draw a shape that came to his mind. He described his urge as a Trance and he drew the shape. He felt that it was very meaningful but he could not understand its meaning. 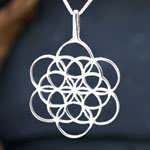 When he discovered my website, he saw the Sacred Geometry jewelry and noticed that some of the shapes reminded him of his drawing. He decided to send me a sketch. When I looked at his sketch I understood that he was trying to sketch the structure knows as the Egg of Life. This is one of the basic and most important shapes in sacred geometry. The structure of the Egg of life is a 3-dimensional structure made of 8 spheres, and in 2 dimensions it looks like 7 circles. The structure represents the basic cell division of the embryo in any multi-cell creature. It is one of the important geometrical rules of creation. The fascinating thing about this story is the fact that the person who sent the sketch is a musician and the structure of the Egg of Life represents the musical scale – the distances between the spheres and the spheres themselves create the notes and the tones and halftones between them. 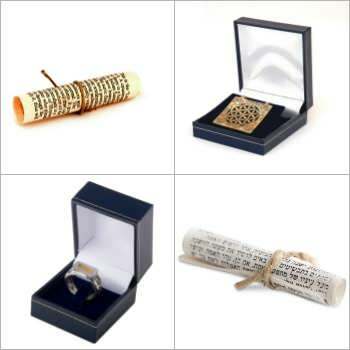 Without knowing, this person was experiencing the cosmic symbol of his calling and the representation of what he does!